Tenia Nelson from Jazzy Paper Designs with y'all today. I created a card for y'all and it goes a lil somethin' like this.....CHECK IT!!! 1. Create card from Black cardstock. 2. Distress and adhere Black and White DP to card. 3. 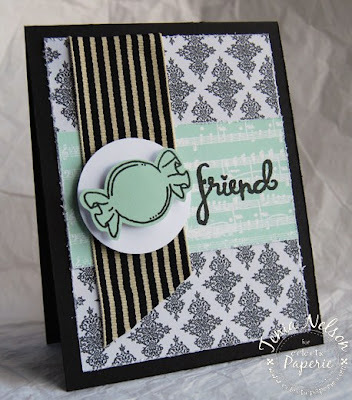 Distress, stamp sentiment and adhere Light Green DP to card. 4. Adhere Black and White ribbon to card. 5. Using a circle punch punch out a circle and adhere to ribbon panel. 6. Stamp image, cut out and adhere to circle panel. Thanks for stopping by and have a wonderful day!! !